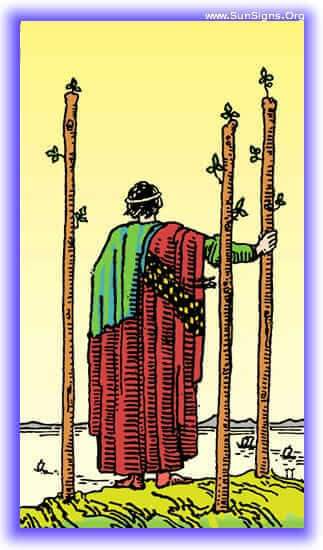 The Three of Wands implies that the idea has been born, the plans have been laid, now he stands upon the hill, overlooking the construction site. The planning complete, the groundwork is now being laid, and the next steps are being laid out. He is past inspiration, past planning, and are now committed to a course of action. 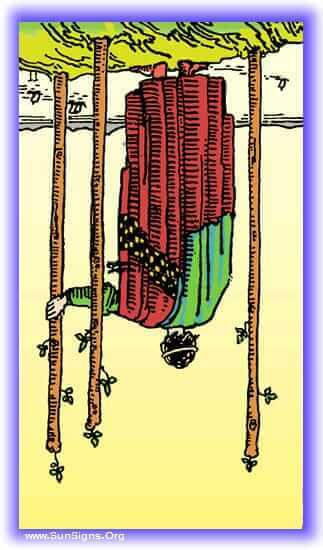 What does this Minor Arcana tarot card mean in the upright and reverse positions? Find out now! Well begun is half done, or so the saying goes. And with this tarot card showing up in the reading, well begun is where you will find yourself. You’ve set your plans, your motivation is in high gear, and you’re reaping those rewards. Opportunities will start presenting themselves at this time, and you need to be canny about taking advantage of them and the change they represent. The opportunity to expand on your original vision exists here, don’t be afraid to do so! The past few months have seen some serious force driving forward. You’ve been working hard and devoting a lot of energy to the project at hands, and it’s been moving forward incredibly well. You’ve seen opportunities come and go, and have picked well from those that were available. Everything is growing at an amazing rate! You find yourself finding the benefits of your careful planning showing up on a daily basis. Offers to expand your business, desires to invest in your plans, and excitement about what you’re doing is rampant. Keep an eye out for opportunities to grow your dream! Like a coiled spring, the potential of your vision waits. Keep doing what you’re doing now, it’s working for you, and one day that spring is going to explode with all its contained energy and you will find that your vision will explode beyond what you planned for. Keep on guiding your ship Captain! I’ve put in the effort, I’ve planned so carefully, why aren’t things working out the way I planned? These are the feelings associated with the Three of Wands reversed. All too often when we don’t see the progress we hoped for, we forget that delays are part of the journey too. Delays, all delays. You’ve been experiencing a period of stagnation in your project. There’s been no progress, and it’s been driving you nuts. Throughout this time every movement you’ve made has been met with delays and obstructions, that period is finally past though, and progress will begin! It’s time to reassess your methods. The path you’re taking right now in pursuit of you project isn’t reaping results, and it’s a sign that you need to rethink how you’re approaching it. Don’t get frustrated though, any project worth doing will have its degree of setbacks, getting past them is the key to success! Pay careful attention to your current plans, something in your direction is leading you to a wall of obstructions that will slow down progress. It may be unavoidable, and if so don’t let it frustrate you, accept it as part of the progress and be ready for a slow period. But for now, keep your eyes open and try to change your tack to sail past it.